The web has been a boon for independent comic creators. Anyone who has the impulse and impetus to create a comic can do so and have an instant publishing platform. This is a bit of a double edged sword, as the signal to noise ratio can make it a bit daunting to get started. Here’s a list of webcomics, some funny, some autobiographical, some on-going and some as discreet stories. I’ve been part of an all-female comic collective called Team Girl Comic. It’s an anthology of women artists, open to any and all levels and ages of creators. 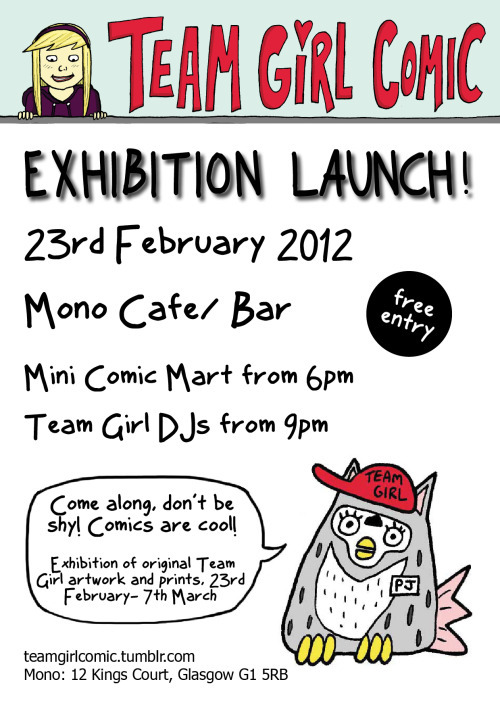 Some of us are showing our comic pieces in Mono and there’s going to be an exhibition launch party on Thursday, Feb 23rd. I won’t be showing a piece, but I’ll be there. Come on over for comics chat, a drink and draw, and Team Girl DJs. And no, I will not be subjecting you to my musical tastes, don’t worry. It’s the same day as the comics part of the Glasgow Film Festival. Denise Mina, Kate Brown, Penny Sharp and Gillian Hatcher will be giving a talk on Women in Comics at 3:15 as well, which might be of interest to some of you.